January 2015 seems to have been a month of odd urges for instant knitting gratification for me. So, when I was cleaning up the massive magazine collection and found these, I knew I had to make slippers in the height of Summer! (Actually really Summer has been a bit of failure this year - a bit heavy on the rain and cool temperatures - not enough sunshine. Slippers in the middle of summer is not really that weird this year). I have to admit it was partially the colour combination that attracted me to this pattern so I went stash diving for blue and brown. The brown tweed is leftovers from the boy's Graeme Street Slouch and the blue is my last two balls from my pi shawl Smoked Camp pi. They look cool together (more than cool in fact) and are on the thin side for DK so not too hard to work double. I had a major issue when I got to inserting the waste yarn for the opening for the cuff. It seemed to be in the wrong place. A little voice in my head said, if you put the hole there, it stuffs up how the toe lies. Did I listen to the little voice? Not really! (I never do and always regret it later!) I did check my working from the pattern and was happy I’d followed it correctly. So I did the hat heel (Cool idea that) and completed the cuff and tried the slipper on and it fits and it’s gorgeous and the toe is all screwed up and twisted around and my knitter OCD is engaged big time. I had to frog it (or partially frog it) once I figured out where the stuff up was. 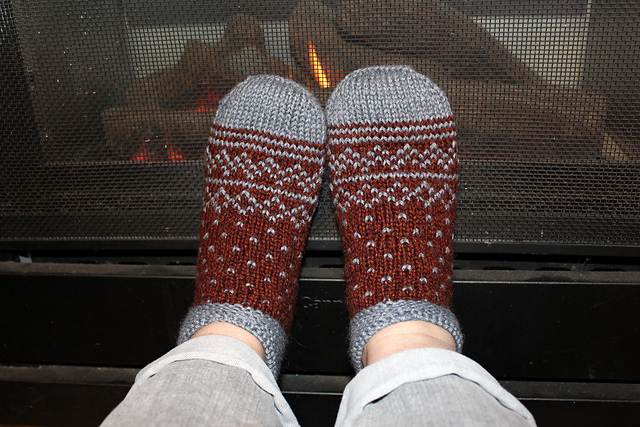 Slipper two was a walk in the park except for some yarn chicken at the end of the cuff. I ended up with about 1 m of the blue left at the end. Toasting my toes in front of the heater. this is not even a posed shot. It was cold enough to have the heater on. Yarn: Blue grey wool blend and reddish brown tweed upcycled from op shop. 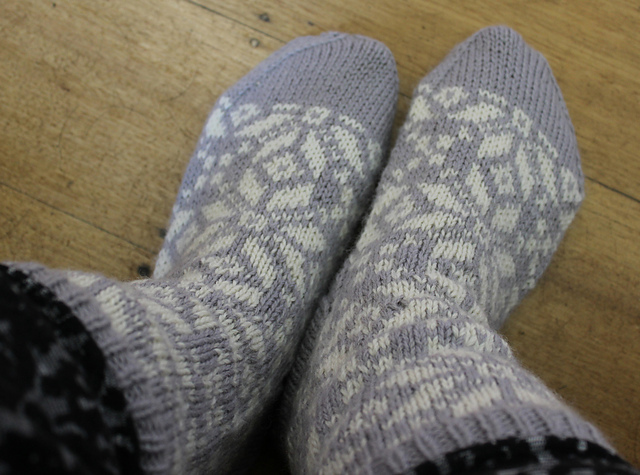 Even after all that I was still feeling some socks but am easing into it by working them at DK weight on big needles. These could also double as slipper socks. This is another pattern that called out to me as I was attempting to tidy, catalogue and potentially cull the magazine collection.... I love Scandinavian type colourwork and the star is such an iconic motif. These socks had a false start. I did the measuring and dithered between the medium and large sizes. 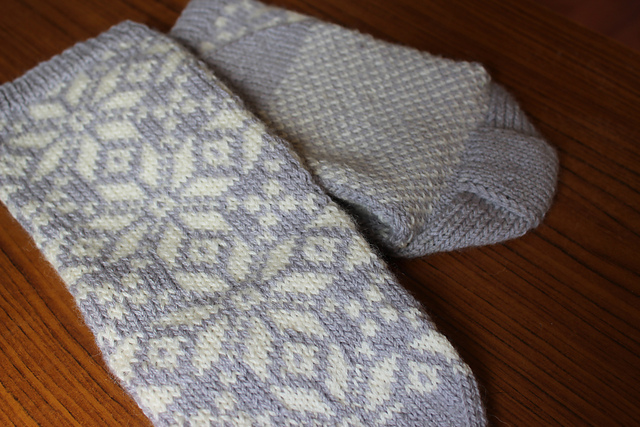 I initially cast on the large size, knitted the band and nearly 30 rows of the colourwork and then tried the leg on. It was WAYYYY too large. (Part of this was probably due to the fact that I was using 3.75mm rather than 3.5mm needles - we don’t have 3.5 mm as a standard size in Australia.). So I frogged it and cast on a medium size instead. 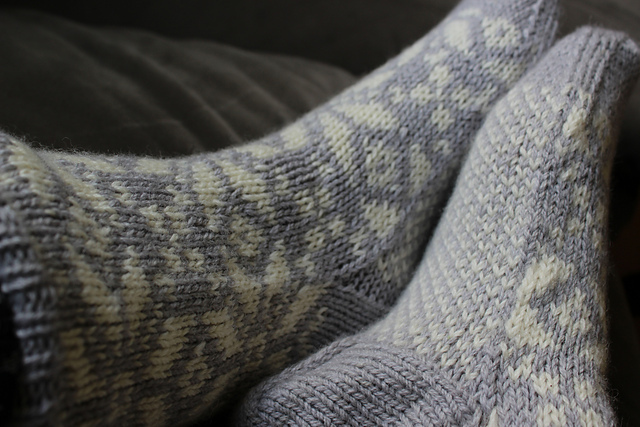 This is an addictive colourwork pattern of the" Just one more row" type thing….. (Made redoing the leg again a relatively fun process). Day one saw the leg colourwork finished. Day two I turned the heel (with tea and breakfast) and finished off the foot (31 rows of colourwork) and the toe. The heel shaping is somewhat different to the Dutch heel I’m used to but fits nicely. The pattern called for decreasing down to eight stitches for the toe and running a gathering thread through similar to fastening off a hat. I decreased down to the eight stitches as suggested but used Kitchener stitch instead (Once I found some instructions to refresh my memory on the sequence). This is tidier but these socks still suffer from pointy toe syndrome. 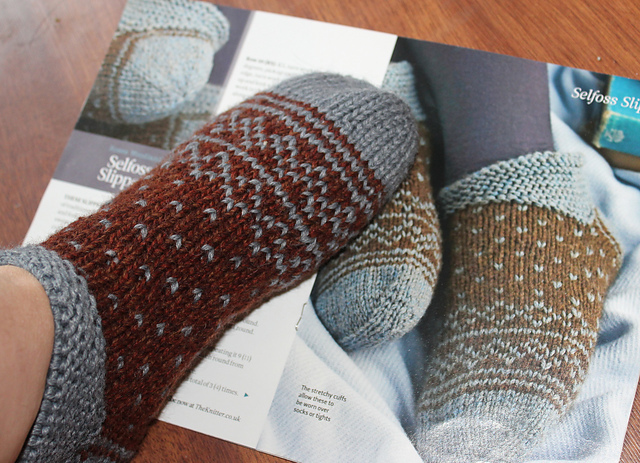 I decided I'd better cast on sock two straight away… (Avoid second sock syndrome at all cost). Second socks are always better. You’ve ironed the kinks out on the first one. The only hiccup on the second sock was running out of the cream yarn and having to stash dive scraps to finish the sock. Yarn: Panda machinewash 8 ply crepe in cream and blue grey machinewash upcycled from the op shop.